Could the Road Have Anything to Do With My Friend's Car Accident? Home » The Law & You » Could the Road Have Anything to Do With My Friend’s Car Accident? Could the Road Have Anything to Do With My Friend’s Car Accident? A friend drove off the road and was injured. But the road doesn’t seem right. Is there anything that can be done? 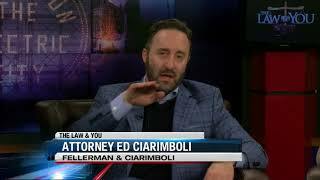 Car accident attorneys Ed Ciarimboli and Corey Suda offer legal options. Dave Kuharchik: We’ve got a question about a road that might have a curve that’s a bit difficult to handle. Guys that always handle it here on “The Law & You” are Corey Suda and Ed Ciarimboli. Good to see you guys. Ed Ciarimboli: Do you sit at home at night thinking up stuff like that? Dave: You know that came up right on the spot. It just pops in my head. I forgot to give a little shout out to Greg. He’s off today. Ed: Yeah. He’s off today, but he’s working. He’s working hard. Dave: We know he does and we know you guys do as well. Another good question in tonight for “The Law & You.” Leo in McAdoo says, “A very good friend of mine was traveling on this road and drove off the road at the curve and was severely injured. The road doesn’t look right to me. Is there anything he can do?” Fortunately Leo sent a photo along. There’s the road. It looks like it has a big curve to the right. Ed: It does, so Leo you’re absolutely right. That road is not designed correctly. We actually tried a case very similar to this a number of years ago here in Luzerne C ounty regarding Suskan Road. This is called a horizontal over vertical curve. Basically, what it means is that the road takes a curve and that curve is out of sight and you can’t see it. What needs to be -leading up to that curve- is they need to have what’ s called Chevron Signs which are just arrows. It gives a driver an indication that there is a change in the roadway that’s coming up. Otherwise, the driving off the road, it’s because you don’t know that there’s anything beyond that curve. You absolutely, potentially, have a case there. I want Corey to tell you what -you know, you need an expert- the nuts and bolts of what we need to do so we can pursue this for you. Corey Suda: The only way we could tell if signs need to be there is if we have an expert go out to the scene. You need to get to us as soon as possible. If you have a police report, that’s great too. We could have an expert go out, measure the distance and see if they need signs in this location. Ed: Those elements are key. Without there being an expert that can get out there and get those measurements, you’re not going to be able to pursue the case. Dave: I know you could hook people up with the right experts and the expertise they have to handle a case like this. There’s the number, the web-site on the bottom of your screen. As well, results matter with attorneys Corey Suda and Ed Ciarimboli. We’ll see you next time. Ed and Corey: Thanks Dave.